A new developer kit from STMicroelectronics is designed to provide engineers with everything they need to start designing battery-free electronic applications that can exchange data with NFC smartphones. The M24LR Discovery Kit is based on STMicro’s M24LR eeprom memory chip, announced last year, which boasts both wired I2C and contactless ISO 15693 interfaces as well as the ability to harvest ambient energy to power additional components. The kit consists of two boards. 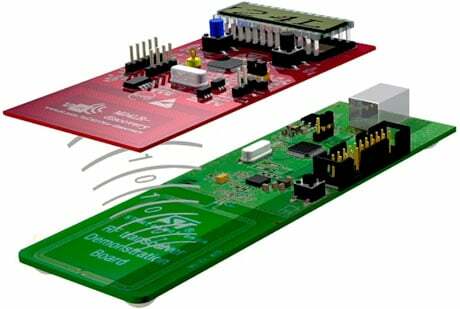 The first is an RF transceiver board with a CR95HF 13.56MHz multi-protocol RFID/NFC transceiver, driven by an STM32 32-bit microcontroller. This powers and communicates wirelessly with a second, batteryless, board that includes the M24LR IC, an ultra-low-power STM8L 8-bit microcontroller and a STTS75 temperature sensor. The RF transceiver board has to be plugged into a PC and comes with demonstration software, while the M24LR board can also be powered by Android NFC phones that support ISO/IEC 15693 using STMicro’s NfcV-Reader app. “The turnkey development platform helps accelerate the creation and integration of energy-autonomous data collection, asset tracking or diagnostics capabilities in a wide variety of applications,” says the company, adding that possible use cases include phone and tablet accessories, computer peripherals, electronic shelf labels, home appliances, industrial automation, sensing and monitoring systems, and personal healthcare products. The M24LR Discovery Kit is available now from STMicro distributors at a recommended resale price of US$17.50.